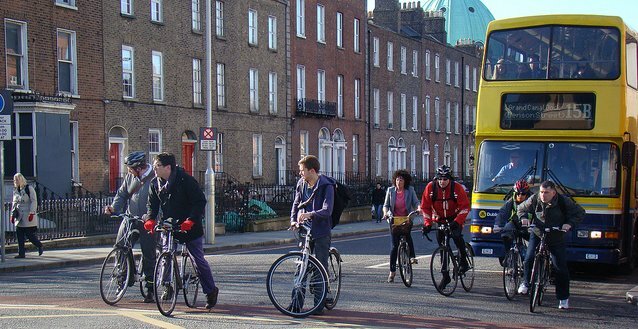 Over 39,000 commuters in Dublin count themselves mainly as cyclists, up by 26% since 2006, according the 2011 Census. In all of Co Dublin, which includes the four council areas combined, the modal share is at 5%, up from 3.95% in 2006. It accounts for an actual increase of over 8,000 people. However, people who cycle less regularly and those who use a bike for a small part of a longer commute — such as many Dublin Bike users — are not counted by the Census as cyclists, so the total number of cyclists is likely to be even higher. Dublin Bikes now has around 46,000 long-term subscribers who have clocked up over 3.5 million trips since September 2009. The Dublin City and Dún Laoghaire-Rathdown council areas account for over three quarters of the 39,044 people who are mainly cyclists, with 23,265 and 6,869 cyclists respectively. The strongest growth in cycling is also in these areas. Those who say they ‘usually’ use a bicycle to get to school, work or college has increased by 29% and 37.5% respectively. Those who mainly cycle in Dublin City now account for 7.5% of commuters, up from 5.6% in 2006. While in Dún Laoghaire-Rathdown cyclists accounts for 5.25% of commuters, up from 3.85%. The rate of growth between the censuses was slowest in South Dublin at 6.92%. Those who are primarily cyclists in South Dublin (4,985) account for only 3.09% of commuters in that area, up marginally from 2.77%. Fingal rate of growth was better at 21.89%. While Fingal’s actual number of commuters who are primarily cyclists (3,925) is lower than South Dublin, the ‘modal share‘ of cycling in Fingal is larger at 3.96%, up from just 1.95% — nearly a doubling of the share of cycling, although from a very low start. The recently reported morning rush hour traffic counts shows that there was a 45% increase in the amount of cyclists entering the city centre in the last five years. This figure is larger than the growth of any one area because many of the cyclists from all areas converge on the city centre. The census does not count those who cycle a day or two and mostly use other means of travel; and the traffic counts — based on the numbers crossing the canals — do not count people who start within the canals on their own bikes or the vast bulk of Dublin Bikes users as all Dublin Bikes stations are currently within the canals. The national target for cycling is 10% of all trips by 2020 and to reach this target it is expected that Dublin would have to aim for a target of 20-25% of trips. Even within the Dublin City and Dún Laoghaire-Rathdown areas, figures for cycling varies. A number of Local Electoral Areas have reached or are close to reaching double figures for the modal share of cycling. These include Pembroke–Rathmines at 12.2%, Crumlin-Kimmage at 9.3%, Clontarf at 8.5%, South-East Inner City at 8.6%, South-West Inner City at 8.9%. If the rate of growth in cycling stays stable or grows, cycling should account for over 10% of commuters in nearly all of these areas by the next Census. 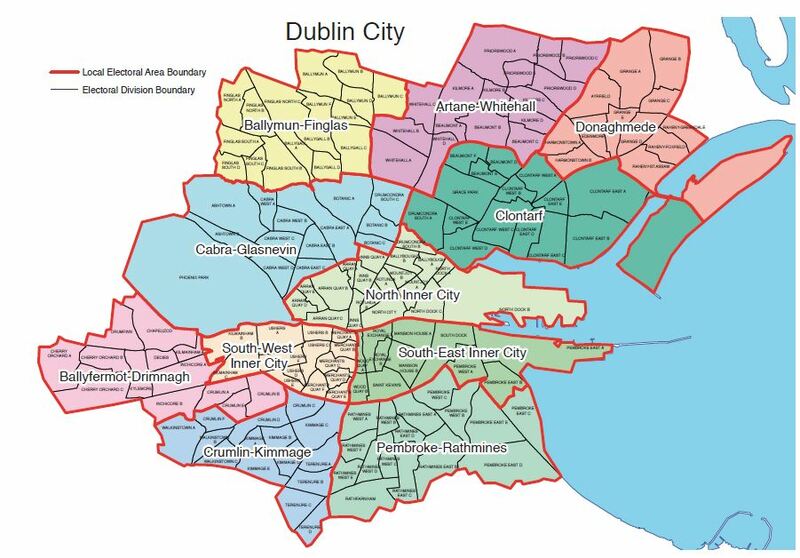 And there are other areas not far behind such as Dundrum at 7.8%, the North Inner City at 7.5%, and Cabra-Glasnevin also at 7.5%. But there are areas still below 5% modal share for cycling, such as Ballyfermot-Drimnagh at 4.4%, and urban Dublin county areas, such as Tallaght Central at 3.7%. Well done for getting this data analysed from the CSO SAPS. I had thought we would have to wait for the commuting report in December before this information could be derived . I am delighted to see that there has been such a significant increase in cycle commuting in just 5 years in Dublin. From talking to my local bike shop owner, the take-up of the cycle to work scheme is still high, so the trend is probably still on the up. The census data is surely more reliable than the one-day canal cordon counts so we have a better idea now of the rate of change of modal share. Cork city is also up 20% (from a low base), Galway city: no change, Limerick and Waterford cities both down about 10%. I think this tells us that the cycle to work scheme alone is not enough to make people change mode. Perceived safety, cycle infrastructure and traffic congestion are probably key drivers. You can see a map showing, among other Census stuff, the cycling rate in different parts of the country here. I captured the Dublin map here. Unfortunately cycling levels seem very low outside Dublin. First paragraph fixed – thanks for the feedback. Thanks for that Jim — had seen those maps before they included the transport data, but great to see the transport data in there. Great analysis and a really helpful post. Do you know what has led to this big uptake in cycling? Well done again Cian. 26% is fantastic, and Dublin will lead the way for other cities, then towns. Fair play to you. Great blog post. I found a ward – Rathmines West B (really Mountpleasant) – that is at 12.63 for bike and 37.74 for walking. That is over 50% active travel. Is this the most sustainable ED in the country? Worth noting that the Census is a snapshot in April 2011. If the trajectory is upward, are there EDs at 15% by now and is Dublin City veering towards that magic 10% threshold, in the summer months at least?